Siblings Liam Fitzsimmons, 8, at left, along with Boudica Fitzsimmons, 9, discover there might be treasure in the basket as they roam the 2017 Buckskinner Camp at the Frontier Day’s Celebration at the Fort Museum and Frontier Village. 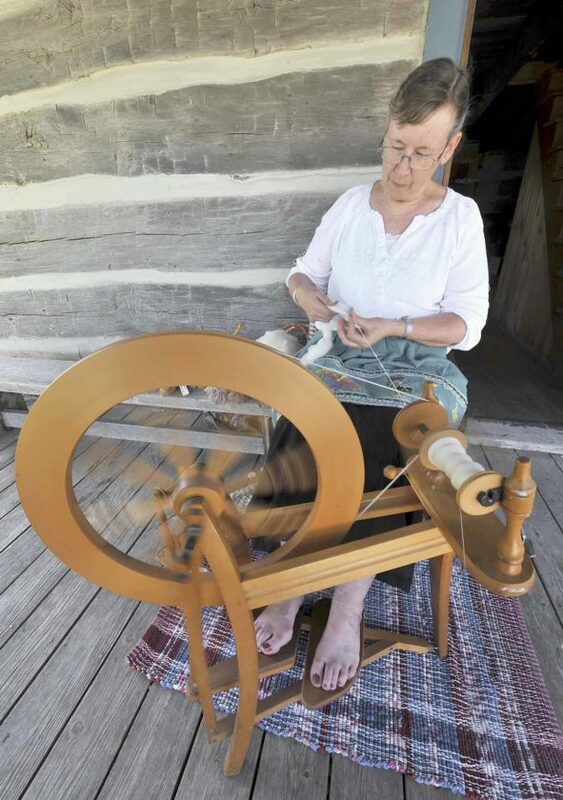 Kris Christy-Hogan, of Gowrie, spins wool into yarn during the 2017 Frontier Days Celebration at the Fort Museum and Frontier Village. Christy-Hogan is also working with the museum to get an antique loom operational again. 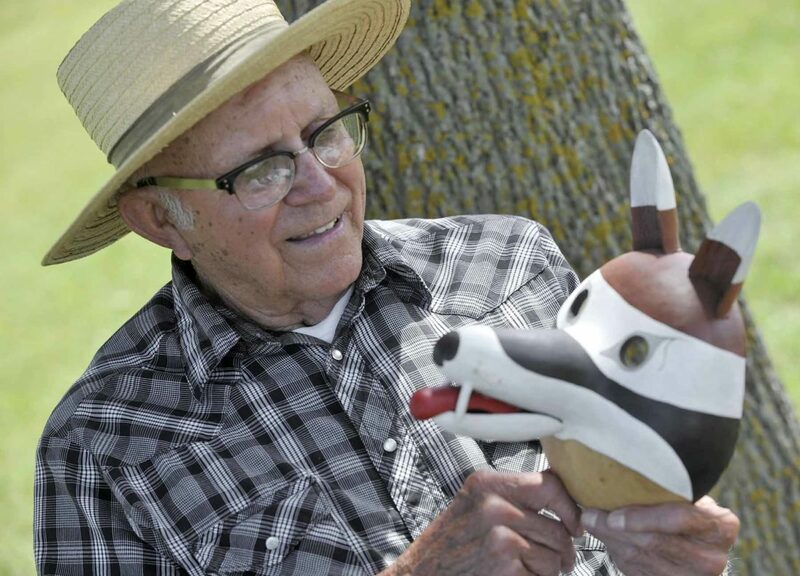 David Carlson, of Otho, looks over a mythical animal mask he made from a gourd during the 2017 Frontier Days Celebration at the Fort Museum and Frontier Village. Carlson was demonstrating his gourd carving skills for visitors. 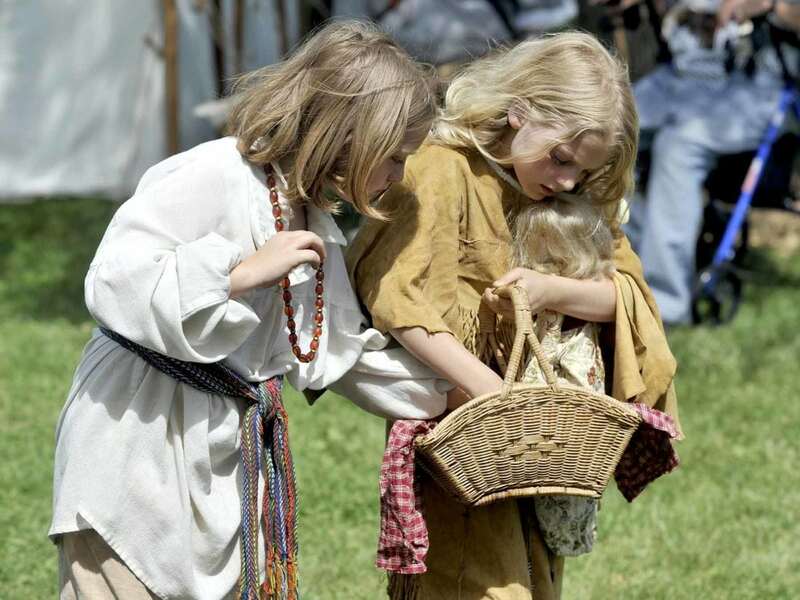 Siblings Liam Fitzsimmons, 8, at left, along with Boudica Fitzsimmons, 9, discover there might be treasure in the basket as they roam the 2017 Buckskinner Camp at the Frontier Day's Celebration at the Fort Museum and Frontier Village. 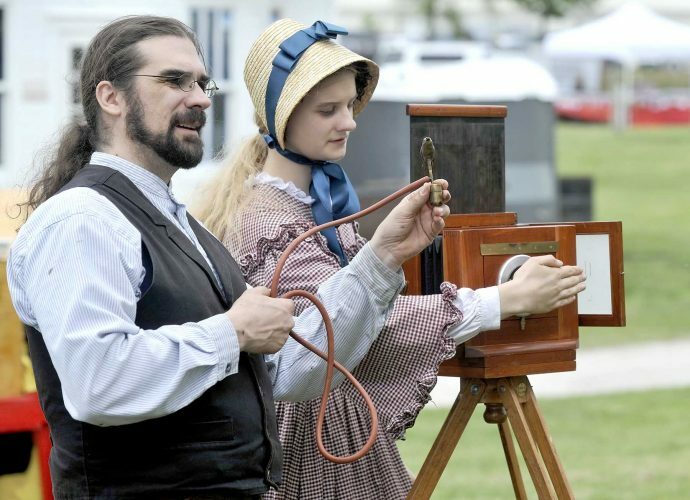 An old celebration is going back to its roots as the Fort Museum and Frontier Village presents a family fun extravaganza of Fort Dodge history. The Original Wild West Frontier Days will be held Friday through Sunday at the museum, featuring the buckskinner’s camp and Ghost Garrison of recent years, and also bringing back the excitement of live cowboy shootout-style entertainment and trick rope expertise. Cheryl Sherry, now executive director of the museum, was impressed by those historic entertainers when she first moved to town in 2002. “They had a group that did a Cowboy Camp, that did the old fashioned shoot-em-ups,” Sherry said. “When people came out here it was kind of like coming to a Renaissance festival. At large on the grounds over the weekend will be the Hole in the Sock Gang, a premier Midwest 1880s street theater group. They’ll be all over the festival, but their camp will be in front of the stockade on the lawn, Sherry said. Visitors will also be treated to a top-notch, interactive trick rope show. “Our big star, Marty Tipton — the Oklahoma kid,” Sherry said. “Oklahoma Cowboy Hall of Famer. He’s the only trick roper in the U.S. that can trick rope a 100-foot-long rope. He’ll also have short ropes to teach the kids, Sherry said. This is the first time in years that the Fort Museum and Frontier Village will be putting on the event itself. The group which ran Frontier Days in the past is now running the Genesis Music Festival, a three-day event over the same weekend. Sherry has found plenty of local volunteers to help bring the weekend alive too. Roger Netz, aka the “Sandyhill Kid” will provide Western songs and storytelling at the Opera House porch, Sherry said. Dan Prochaska, aka “Dan the Piano Man” will play old time piano favorites in the Trading Post gift shop throughout Friday and Saturday. Volunteers from the Oakland Cemetery Walk will portray famous Fort Dodgers throughout the event as well. Over 40 vendors will be on hand, with an emphasis on hand-crafted items. Sherry said most of these are new to the event, but one familiar face will return. That would be Little John’s Root Beer stand, whose booth was destroyed by arson at last year’s event. The stand is owned by Mel and Patricia Theisen, of Kansas City, Missouri. “Patti is very excited about coming back. The gentleman that originally did the kettle corn at the museum — and they’re pals — he is coming to do kettle corn. They will be set up right next to each other in the Buckskinner Rendezvous Camp,” Sherry said. Sunday, Prairie Lakes Church will provide a nondenominational church service in the frontier village chapel at 10:45 a.m.
Friday morning starts out with an opening ceremony around the flag, with help from the Serving our Servants group. After that the SOAR raptor sanctuary group will have an exhibit in the stockade area, showing off two owls and two hawks. And there will also be a 50s sock hop for teens, featuring Ritchie Lee and the Fabulous 50s, Sherry said. Kids 12 and up can get a half price three-day pass during this time. A wristband will get visitors in to all three days. Cost is $10 for ages 12 and up, $5 for age 5 to 11, and younger kids are admitted free. Parking will be at Iowa Central Community College, with the main entrance to Frontier Days right across from the parking ramp.